• Co-created with Yuko Yamashita, Smooth & Straight Expert from Tokyo, so you will always have HAIR ON YOUR SIDE. Ready? Use after every shampoo. Gently masage through to the ends of your hair, then rinse thoroughly. 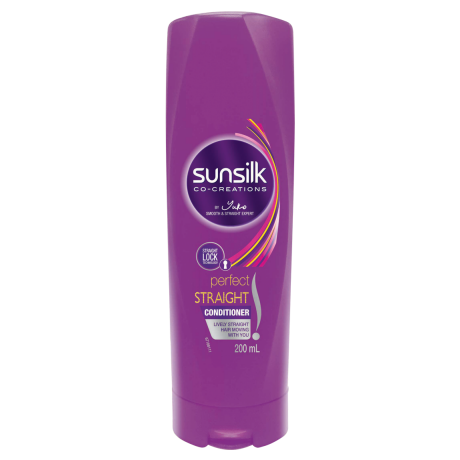 For even more incredible hair, why not combine it with Sunsilk Perfect Straight Shampoo? Water, Cetearyl Alcohol, Dimethicone, Stearamidopropyl Dimethylamine, Behentrimonium Chloride, Hydrolysed Silk, Mineral Oil, Glycerin, Amodimethicone, Peg-7 Propylheptyl Ether, Cetrimonium Chloride, Cyclotetrasiloxane, Dipropylene Glycol, Lactic Acid, Sodium Chloride, Disodium Edta, Methylchloroisothiazolinone, Methylisothiazolinone, Phenoxyethanol, Fragrance.